Autumn is here and with it come the rusty colored parks and woods, sidewalks covered in falling yellow and orange leaves. The squirrels play around, looking for food, preparing for winter. No, no, no, going astray here! Nature has always been an inspiration for jewelry designers. Fauna and flora have been depicted in the most creative ways possible, from the most figurative to the conceptual. And that still holds true today. Flowers tend to dominate, specially the high jewelry scene, given the opportunity they allow for intricate metal work and precious color play, resulting in very sophisticated jewels. However, the LEAF is less frequently represented. Or so I thought. The latest issue of Vogue Gioiello, edited by Vogue Italy, celebrated the season by pulling together several beautiful examples of leaf shaped jewelry, both contemporary and vintage. As this is a theme I have worked a bit, I stopped to think about it. The leaf results definitely in a sunnier jewel. Mainly worked in yellow gold and warm colored stones or diamonds, it is no surprise. Less formal than the flower, less romantic than the heart, it is still a feminine shape. It is approachable. And maybe that is why I like it. 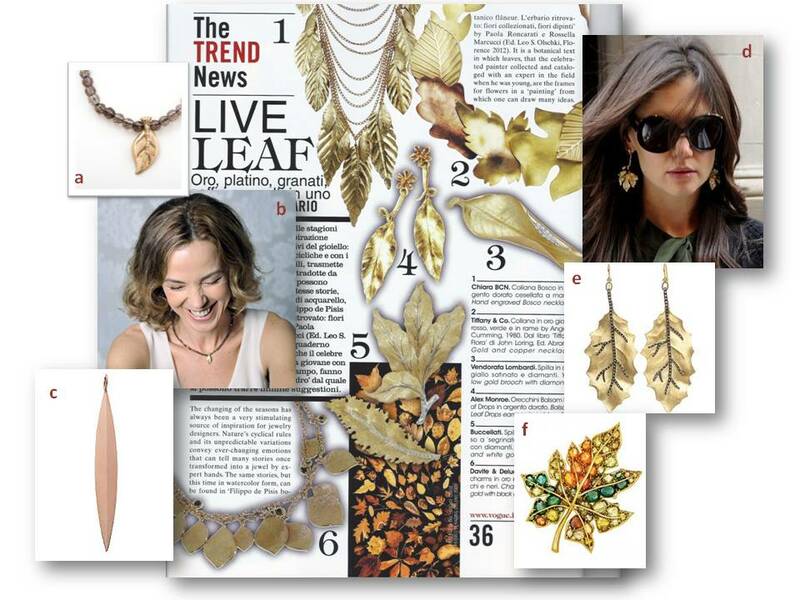 Exploring a bit my favorite designers’ work, I discovered wonderful earrings by Cathy Waterman (e), the lovely Katie Holmes wearing Cindy Chao’s leaf earrings (d) – a magnificent example of her White Label collection, the streamlined and always stylish leaf charm by Jennifer Fisher (c), along with the epitome of Fall – Verdura’s leaf brooch, a great example of his gifted approach to color (f). You can also spot me wearing my own design: the Midsummer Dream yellow gold leaf pendant (b). What about you: are you a Flower or a Leaf person? This entry was posted in Jewelry, Jewelry Trends, Personal style and tagged Cathy Waterman, Cindy Chao, Jennifer Fisher, Jewelry, Katie Holmes, Leaf, Silvia Taveira, Style, Trend, Verdura, Vogue (magazine). Bookmark the permalink.